Here is some relief carving by an artisan based in Canada. Jonathan is Eastern Orthodox and is working very much within the iconographic form, the principles of which he will not compromise, as one would expect. However when I chatted with him about his work, it struck me that as well the more familiar Eastern forms, he has an interest in traditional Western forms of iconographic art as well. He is happy therefore to consider the portrayal of some Western types that are not part of the usual Eastern canon. He works in wood and a soft soapstone from Kenya called Kisii stone. 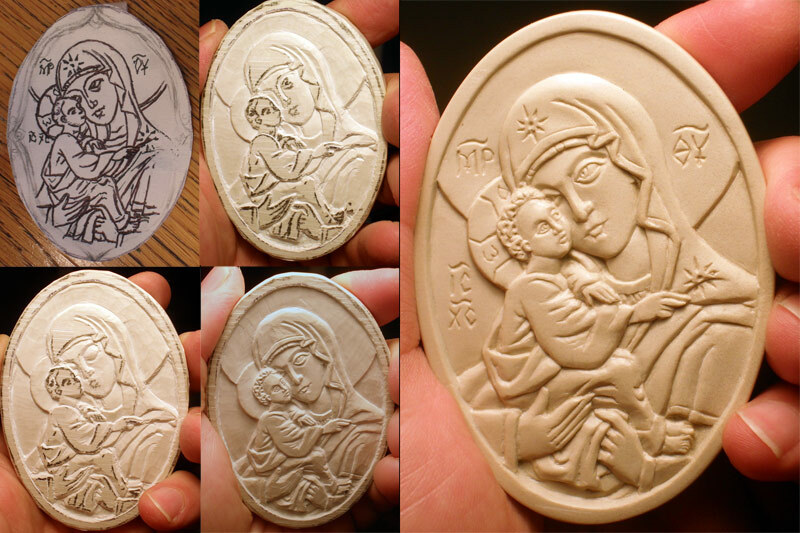 I am fascinated by relief carving, and wrote an article about some of the principles behind it here. I have limited experience of sculpting in clay, in which I created a full three dimensional form in a traditional naturalistic style. This was an additional class when I was studying primarily academic drawing and painting in Florence several years ago. At the level I was working at, I found it in many ways easier to pick up than painting. When painting, the artist has to process the information received via the eye from a 3-dimensional form in such a way that he produces a 2-dimensional image. This conversion from 3-D to 2-D is not necessary in naturalistic sculpture and the final image is 3-D also. So in this respect it is a simpler process. When I asked Jonathan about it, he described a process in which the 3-diminsional ideal is converted into a fully 2-dimensional image first – a drawing – and then this is converted back into the partially 3-dimensional form of the relief carving. So his first step is to draw the full line drawing, which must be just as detailed as if he were ultimately painting an icon rather than carving it. Next, this drawing is transferred onto the surface of the stone. He uses tracing paper to do this. Then he cuts around the main shapes to produce a vertical, stepped edge. After this the subtleties of shadow are introduced by introducing varying slopes on those edges and detail within the shapes. I asked him to send me some photographs of work in progress to help us understand this. He kindly sent some and these are shown below. This means a relief sculptor using this method must be a good draughtsman. In contrast it is conceivable that someone could sculpt well in the naturalistic style, but is unable to draw well (and I have met one or two who told me they couldn’t draw). 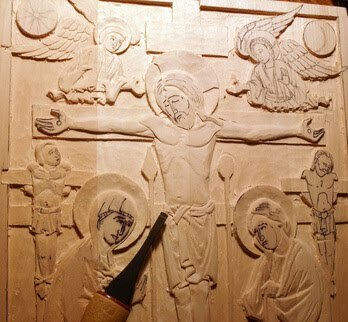 His website with more photographs and information is at http://pageaucarvings.com/.